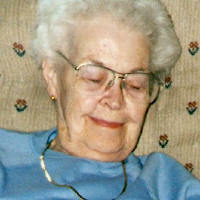 Ethel N. Friese, nee Ward, 94, of Fenton, MO died Sunday, June 24, 2007 at her residence. Mrs. Friese was born August 24, 1912 in St. Louis, MO to John N. and Maggie Mae (McNeely) Ward; they preceded her on death. In 1959, she married Harry Friese in Lebanon, IL; he preceded her in death. Ethel worked as a Civil Service Secretary and was a former member of St. John United Church of Christ in Trenton. Visitation will be Wednesday, June 27, 2007 from 11:00 AM – 1:00 PM at the Moss Funeral Home in Trenton. Memorials can be made to Alzheimer’s Research and will be received at the funeral home.